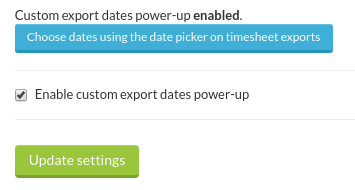 In Tanda, you can enable the Custom Export Dates Power-up which allows you to select, view and export an alternative date range of Timesheets. Just keep in mind though this may not work with your Accounting & Payroll system, for example if you have a Weekly Pay Calendar and you're trying to export a Fortnight of Timesheets. You do have the option to export an Excel document though. You can then click on the blue Choose Dates button to go directly to the date picker, otherwise this is also selected by going to Timesheets > Weekly (or Fortnightly) > Export to Payroll. If you receive an error, it may be that your system can't accept pay periods outside your normal range. In this case you could manually enter for this exception, by using the Excel Summary.